H3X grills feature the legendary Broilmaster cast aluminum grill head outfitted with a two-piece single-level stainless steel cooking grid set, stainless steel H-style burner with separate left/right control, stainless steel control panel, chrome-plated steel warming rack, and electronic ignition. With 653 square inches of total grilling area, Charmaster Briquets, and 40,000 Btu, your H3X grill can handle just about any party. Choose the H3X grill head and add a cart, in-ground post, or patio post with base - available in stainless steel or black - plus shelving or even a side burner. 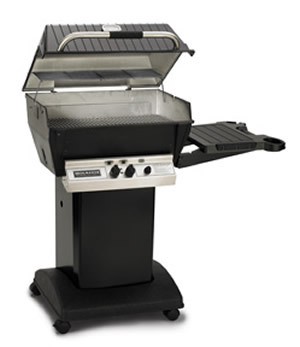 Or select a simple H3X grill package with one shelf and black mounting - cart, post, or patio post.